Endometriosis is a disease which effects 1 in 10 women, producing sometimes debilitating and life changing symptoms. The event is called the ‘Primrose Ball’. 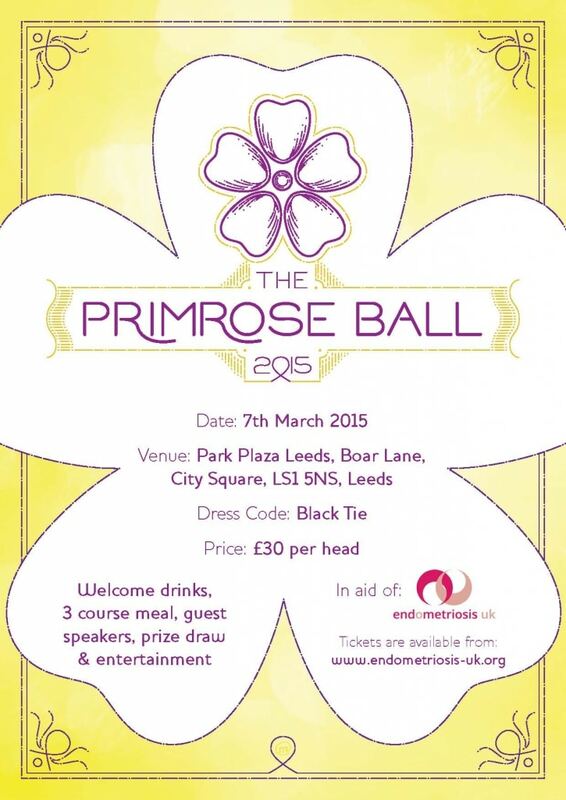 It will be hosted on 7th March 2015 at the Park Plaza in Leeds and it is in aid of Endometriosis UK. It is celebrating the real women with the disease and coincides with Endometriosis Awareness Week and International Women’s Week. The event includes welcome drinks, a three course meal, entertainment and guest speakers for £30. The guest speakers include the CEO of Endometriosis UK, a consultant and a woman speaking about her personal experience of endometriosis. We have had a great response to the prize draw so attendees can expect to have the chance to win tickets to the Live X Factor Tour, nuffield health gym goodies, beauty vouchers, dance lesson vouchers, 3D Mascara and designer clothing. We want to raise the profile of Endometriosis as well as enabling women and their friends/families to have the opportunity to attend a glamorous event celebrating the daily achievements they make.